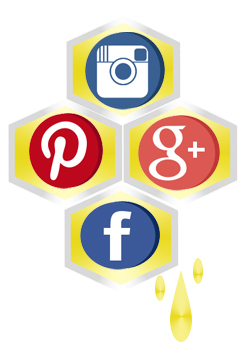 Have you heard of Opinion Outpost? It’s a FREE online tool that connects major corporations and businesses to their customers in a true “win-win” situation: By taking paid surveys online with Opinion Outpost, you can make money and earn rewards quickly and safely from home while helping your favorite brands adapt and grow – just by sharing your opinion! Not only can members earn cash or gift cards to popular brands like Amazon.com* from home or on the go, but users will also automatically earn entries in Opinion Outpost’s $10,000 quarterly prize draw** each time they take a survey. Think about it: Businesses want your opinions so that they can make products you’ll love even more, and they’re going to pay you for it. What’s not to love?! First off, it’s easy. Opinion Outpost members have the opportunity to make money taking surveys online. These can be taken at home on the couch, in between classes at school, or anywhere else with an internet connection. Take surveys to earn points, then turn those points into cash. It’s also safe. Opinion Outpost is one of the most reputable brands in the business because they value their members’ safety concerns. You don’t have to turn over too much personal information to earn cash or other survey rewards for your opinions, and everything is kept private and secure. Plus, it’s FREE to sign up, no credit card required! Best of all, it’s fast. Need rewards quickly? Opinion Outpost has a low minimum redemption level, meaning you can turn your points into money or gift cards quickly or save them up for larger purchases. You’ll earn these points for each survey you complete. 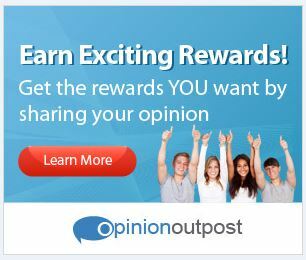 Taking paid surveys online on Opinion Outpost is perfect for students, stay-at-home parents, or really anyone looking to earn some extra cash and rewards. Sign up today! Opinion Outpost is one of my go to survey sites! I have not done them in a while but great for extra holiday money. I tried several survey sites early on and they wound up not making financial sense to me. I don’t recall for certain since it’s been a number of years but I don’t think this was one of them.